Catch up on my previous daily instalments: Travel day, Day 1, Day 2, Day 3, Day 4/5, Day 6 and Day 7 and Day 8. I was feeling well rested after our chilled afternoon the night before. I woke up in the morning desperate for a wee. I did that thing where you try to ignore it and go back to sleep then after 40mims admit defeat and get up for a week and are then annoyed that you didn’t just go straight away! Soon after at about 5am (or is it actually 6am…we still haven’t worked it out) the alarm went and we were packing and on our way. 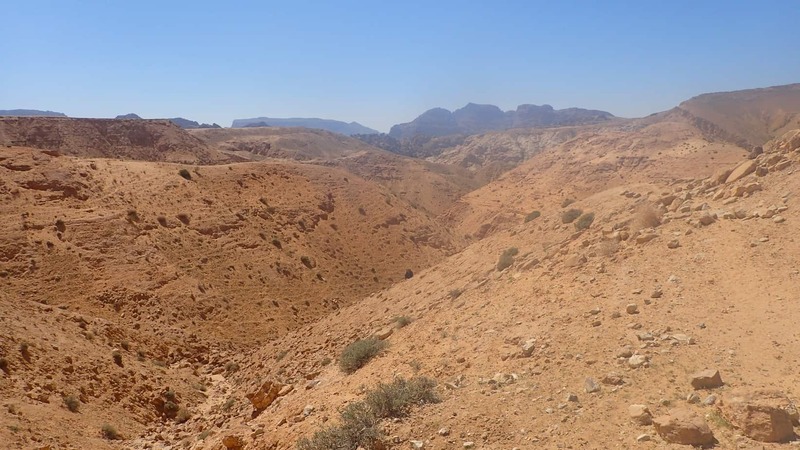 Today was a really easy hike with 21km of a gradual incline through a Wadi. It makes navigating easy and with no climbs or scrambling, we were flying by. The scenery was constantly changing and I loved the way the rocks formed the strange shapes carved from water flow. It was really breathtaking. 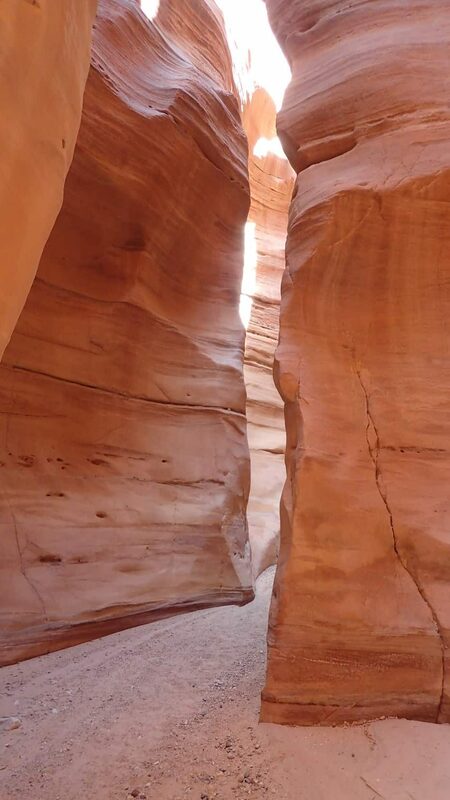 In some sections, the Wadi led us through beautiful narrow corridors. It was impossible not to look up in awe as you passed through. After a mid-afternoon snack of walnuts and raisins, I listened to my favourite podcast – Desert Island Disks. Firstly an interview with David Beckham and then with Bruce Springsteen. I walked on ahead of Cal and Mollie (I naturally walk quite fast anyway) and was enjoying just being and having time to listen to podcasts. We had to do a fair bit of stopping to allow Mollie to stretch out her legs and feet. It’s a problem that has been bothering her from day 1 but is getting really bad as she can’t walk fast and needs lots of breaks. 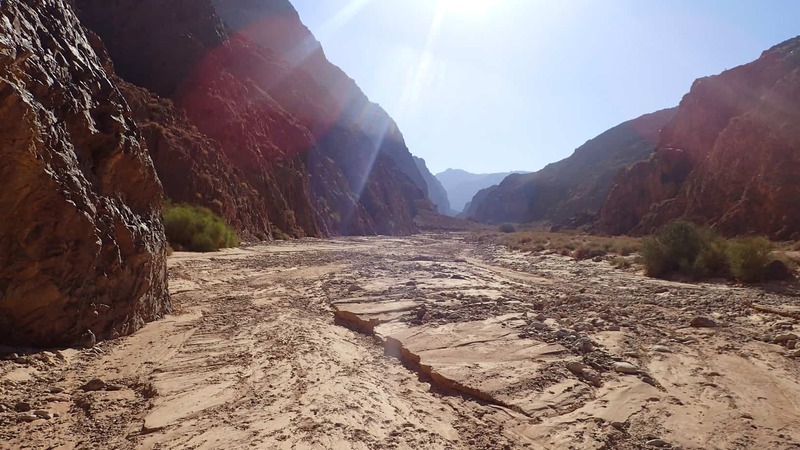 With just a few km left we hit a big climb to get out of the Wadi. It always seems the hardest parts of the day happen just when the sun becomes its hottest. I was dripping with sweat and so happy to find a breeze on the top, even if there was no shelter. 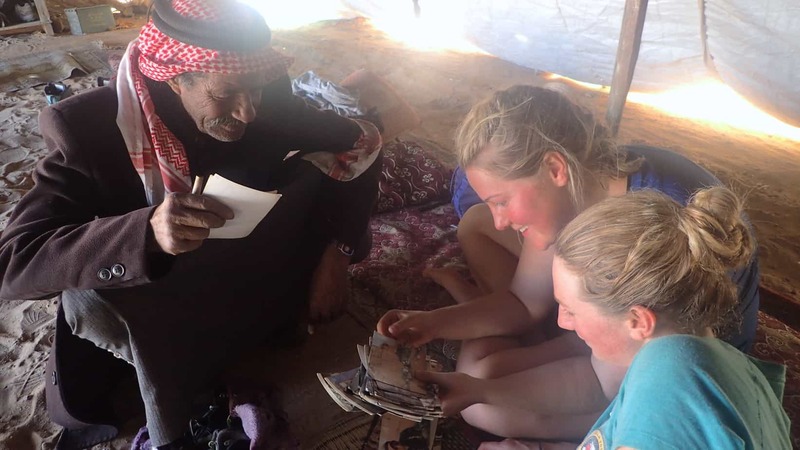 We found the Bedouin village we were looking for as we’d heard there was a homestay we could crash at for the night. 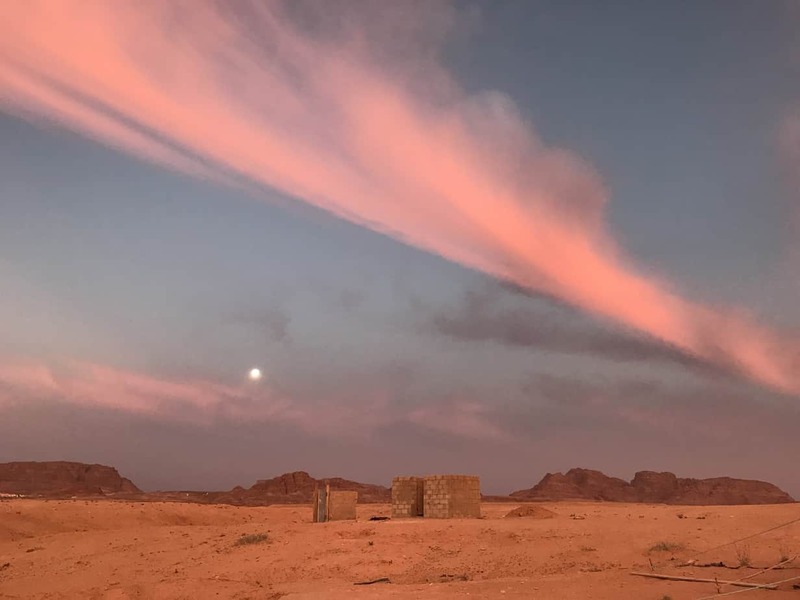 It was such a strange place with a scattering of tents, tin huts, a few semi-built building and then right on the edge a really large mosque that looks so out of place! From nowhere 2 young boys came running to us ‘Abu’ they asked, the name of the man who runs the homestay. 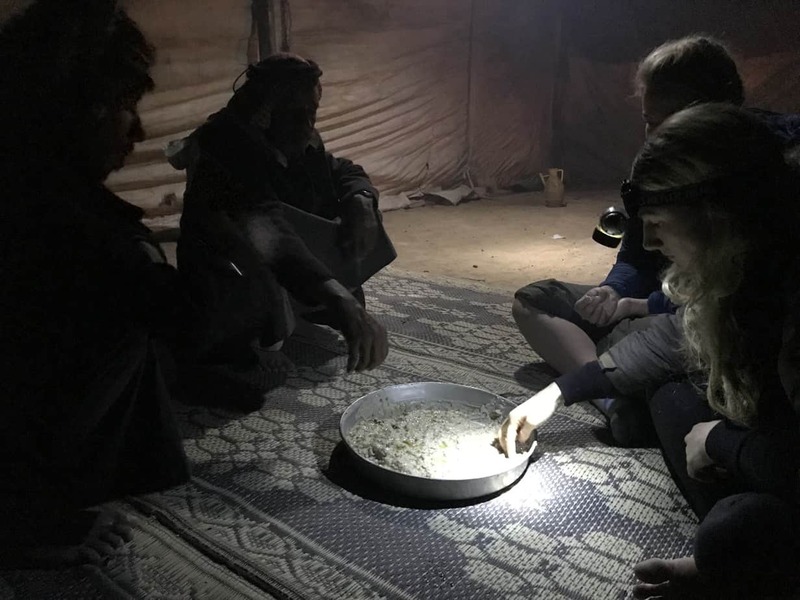 We nodded and they led us to our Bedouin tent for the night where we met Abu and some of his 14 children!! And he started showing us family photos. We felt really at ease straight away. I had a wash using a bucket and changed out of my sweaty clothes. It’s amazing how good a wash can feel after days in the desert without showering. Mohammed (our water man) didn’t understand that we wanted to stay here for the night despite telling him in advance and got really angry about it. He yelled at us on the phone, told us he wasn’t going to bring us water anymore (even though we have paid him) and said he didn’t care if we “f***ing died in the desert”. What a pleasant man! A few other phone calls and we were able to sort out an alternative so we could have water for the last section of our hike, although of course, we had to pay again. We had a team chat to asses Mollies foot situation. Although she’s determined to continue, pushing through the pain could cause long-term damage….which is never worth sacrificing for an expedition. So she made the decision not to carry on. Tomorrow she will catch a lift from the Bedouin camp and will meet our photographer at the camp spot where we will stay the next day. Adventures are such a rollercoaster sometimes! I felt like the last few days have been very up and down with ever-changing challenges – from the 65mph+ winds tearing up my tent in the middle of the night to our rude unhelpful water guide and working out team dynamics and frustrations. But we’ve found a way to get through everything and here we are tackling our last section (in a different way than we planned) but still working together. That felt good! 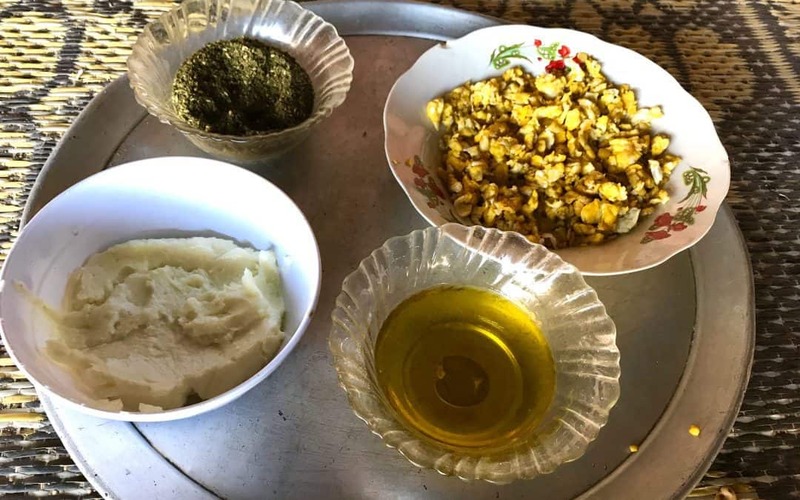 We joined Abu and his family for (putting it frankly) one of the most horrible meals of my life. It was like mushy watery bread mixed in with cheese which tasted like a goat smells and we all ate it with our hands from a big pot. It gave me such bad heartburn I couldn’t get to sleep for hours after. Yuk!!! 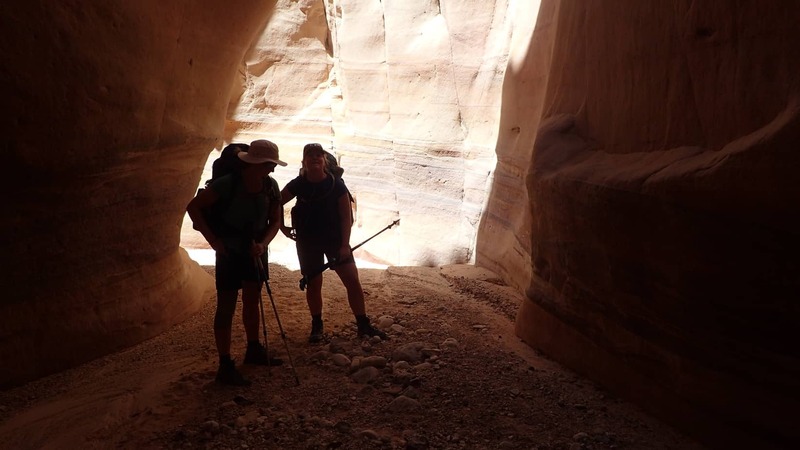 Keep reading my daily instalments…..check out Day 10 on the Jordan hike. 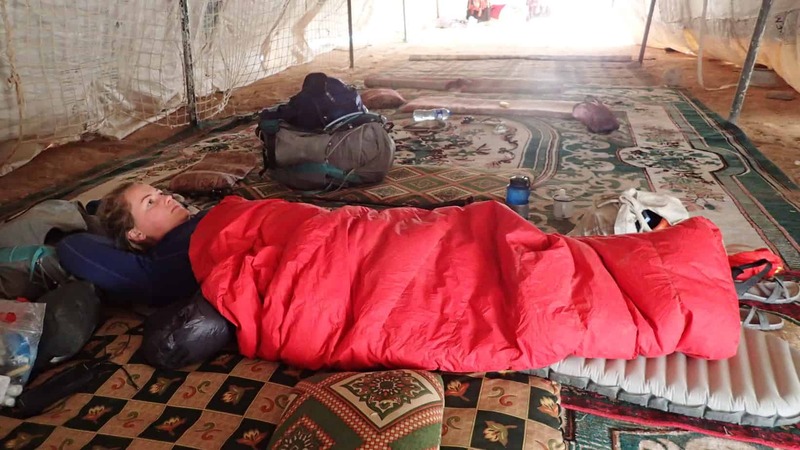 A huge thank you to Tiso and Merrell for supporting this Jordan Expedition. As always, my blogs are my own and are written with 100% honesty. You can follow my adventures on Facebook, Twitter and Instagram.